The reason why Vice President Yemi Osinbajo's helicopter crashed in Kogi state has been revealed. 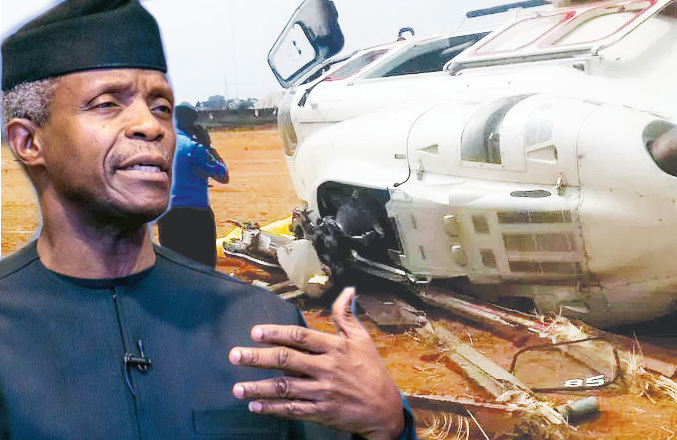 The Accident Investigation Bureau (AIB) has released a preliminary report on the cause of the crash of a Caverton Helicopter which conveyed Vice President, Yemi Osinbajo, to Kabba, Kogi State, linking the accident to inability of the pilot to have a proper view of the field for landing. The AIB also said Caverton Helicopters, as operator of the aircraft conveying the vice president failed to do an “on-the-site risk assessment” of the Kabba Stadium field, prior to attempting to land the aircraft, given the dust usually generated during the landing of an helicopter. AIB Commissioner and Chief Executive Officer , Mr. Akin Olateru, who briefed Aviation journalists in Lagos, yesterday, said preliminary investigations identified ‘Brownout’ as the probable cause of the crash of the AgustaWestland AW139 with registration number 5N-CML. Brownout, in helicopter operations, is an in-flight visibility restriction caused by dust or sand in which the flight crew loses visual contact with nearby objects that provide the outside visual references necessary to control the helicopter near the ground. Said Olateru: “The crew lost visual contact with the ground and elected to use the Instantaneous Vertical Speed Indicator (IVSI) and Radio Altimeter (RAD ALT) to control the descent. At about 14:34hours, the helicopter experienced a hard landing on the right main landing gear and rolled over to the right. The AIB said investigations are, however, ongoing and appealed for public understanding until the final report is out.